OK, it’s back to electoral number crunching, this time on the Monte-y-Culebra Problem. First, some context. From our high point in the Constitutional Reform Referendum of 2007, when we got 50.3% of the National Vote, the opposition has lost considerable ground both in the cities and in the countryside. 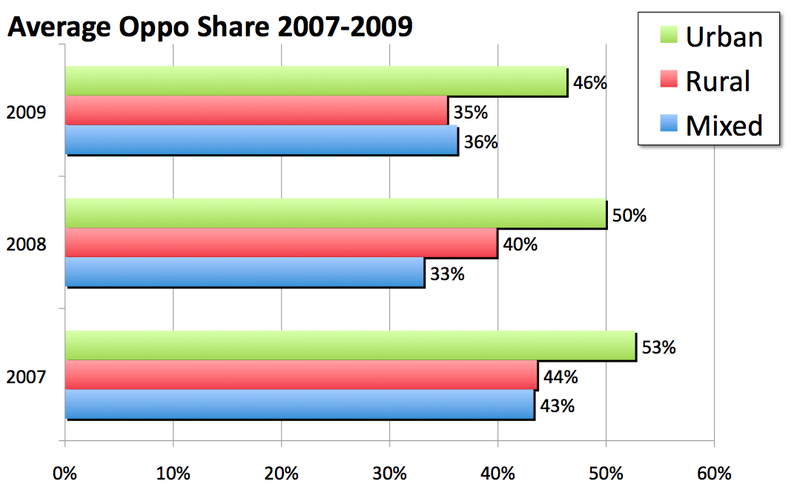 But while our vote-share has fallen everywhere, it’s sobering to realize that the fall from 2007 to 2009 was not linear: we lost considerably more ground in the countryside than in the cities. In all cases, "mixed circuits" – those dominated by small but not tiny towns, or those with a mix of urban and rural populations – seem to behave more like rural circuits than urban ones. 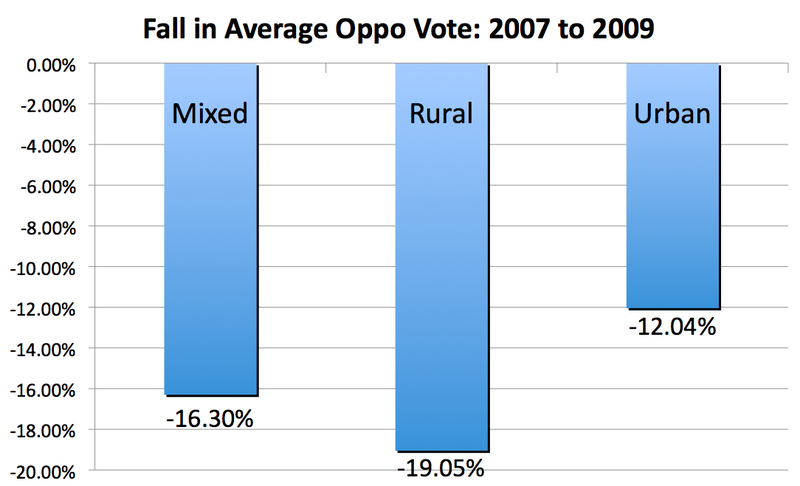 This matters because the CNE-designed electoral system over-represents rural areas relative to urban ones. Though they are home to just 22% of the electorate, the 34 most rural circuits account for 32% of the circuit seats in the National Assembly. That’s just one aspect of the wide pattern of distortions and gerrymandering in the system that could land chavismo with 60% of the seats in the A.N. on the back of 49% of the National Vote. So, we just throw in the towel? Not at all! As recently as 2007, the opposition won in nine out of those 34 circuits, getting a respectable 907,000 votes to the government’s 1.12 million. In 2007, the opposition won in places like Cocorote (in Yaracuy state), in Ejido (in Mérida), out in the Western part of Margarita island, and in the South of Lake Maracaibo. It came within 5 percentage points of winning in places like the Western part of Falcón State, and Nirgua, and even in – get this – Tucupita. It’s not like it’s written in stone somewhere that we can’t be competitive in places like that. It’s just a matter of showing up – and campaigning.